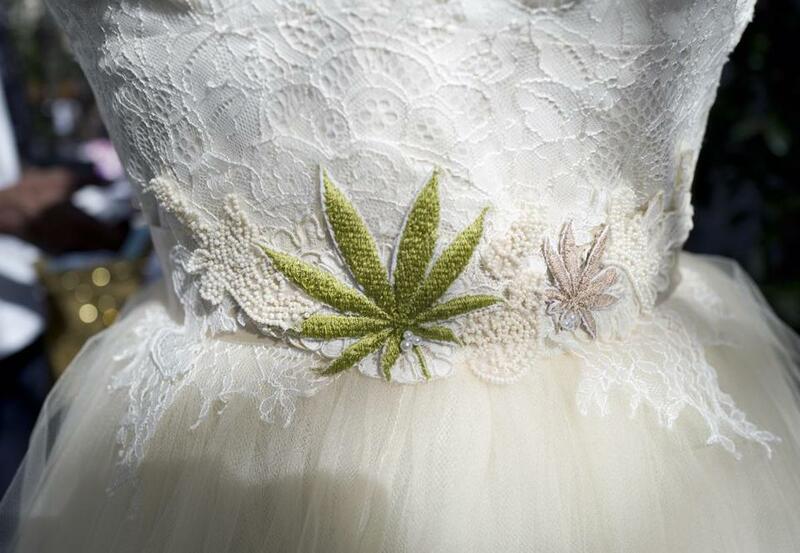 A wedding dress with an embroidered marijuana leaf on the front is seen displayed at the High Vibe Bride booth during the Cannabis Wedding Expo in Los Angeles on Saturday. Now in its fourth year, the expo has traditionally been held in West Coast locations, with its first of the season on Saturday in Los Angeles. 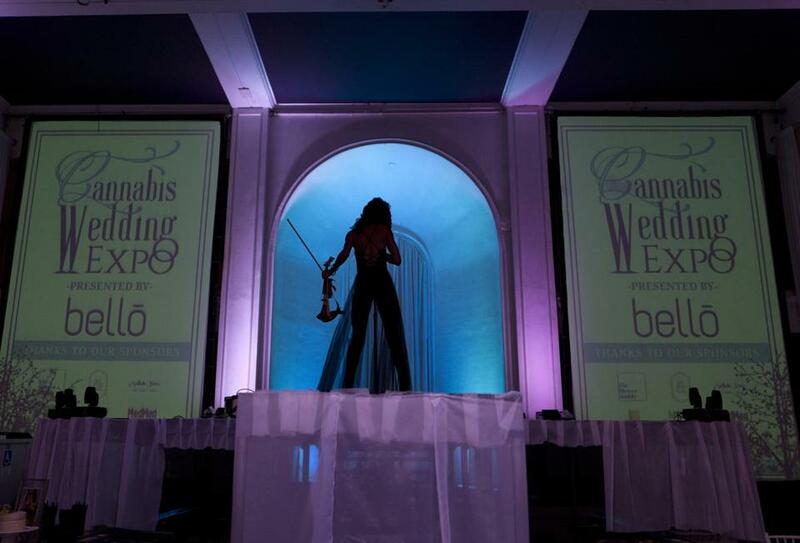 But starting this fall, the Cannabis Wedding Expo is heading to the East Coast. The organizers hope to host their first Boston expo in October, said founder Philip Wolf. 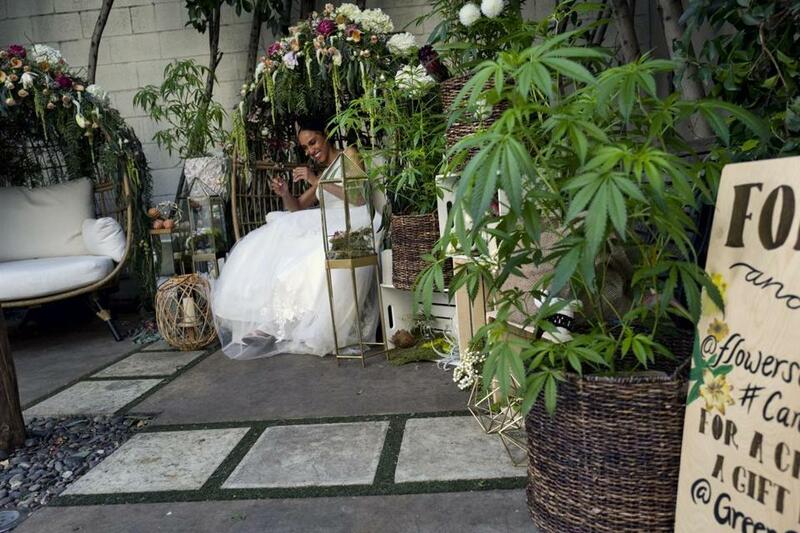 Three other Cannabis Wedding Expos will be held this wedding season — from now through March — in San Francisco, Denver, and Las Vegas. 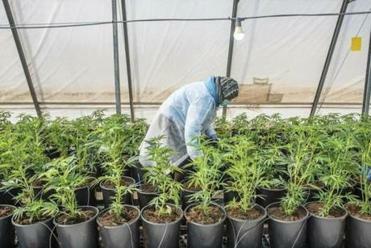 Canna-couples at the expos have a chance to acquaint themselves with items such as hemp wedding dresses, marijuana floral arrangements, and cannabis-friendly venues, according to the expo website. 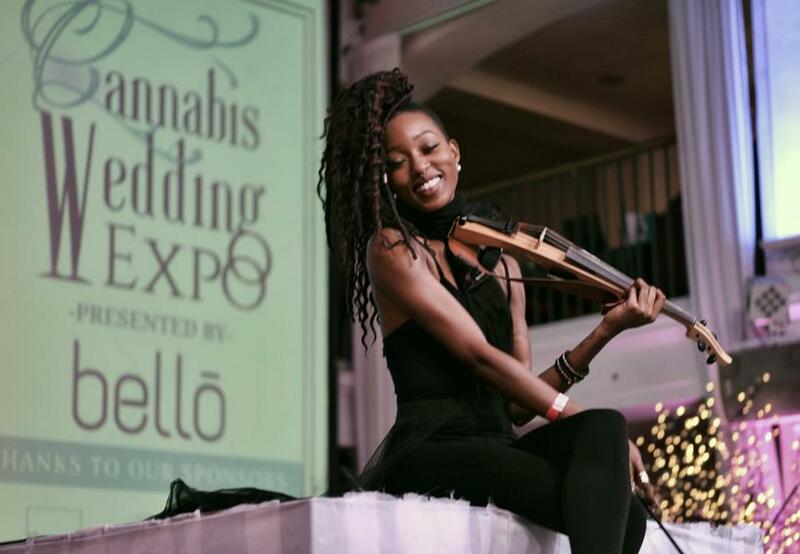 “The Cannabis Wedding Expo is a fun and educational opportunity for couples and canna-businesses to come together and learn about how to safely and intelligently bring cannabis into their special day in classy and sophisticated ways,” the website says. Wolf said the expos are an opportunity for budding entrepreneurs and established businesses alike to make their mark in the cannabis industry. The expo “speaks to the level of opportunity there is in the hospitality segment,” Wolf said. Vendors travel from all over the country for these expos, Wolf said, and more companies are starting to travel as the cannabis market grows. For wedding planners who can’t wait until the fall to start their research, the best thing to do is educate themselves about local regulations around gifting marijuana, Wolf said, and then get creative. From giving marijuana as a gift to bridesmaids or groomsmen, to offering guests a cannabis-infused buffet bar, the options are endless, as long as it’s legal in your state. 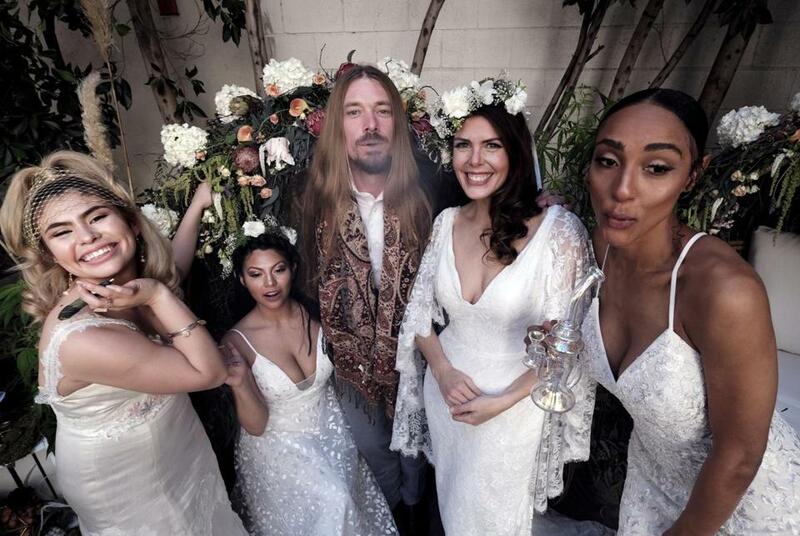 Philip Wolf, CEO of the Cannabis Wedding Expo poses with models wearing wedding dresses designed by High Vibe Bride, Simply Bridal, and David’s Bridal. 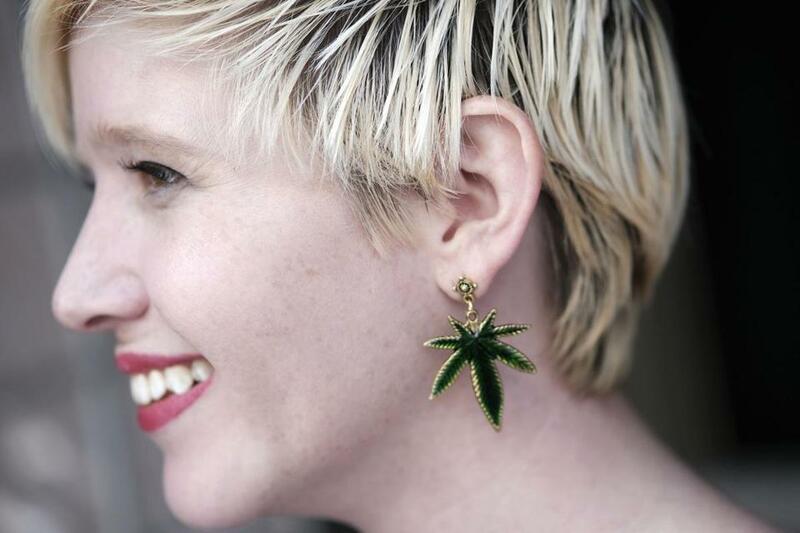 Alice Campbell from Irie Weddings and Events sports a marijuana earring. A model poses for a photo wearing a designer wedding dress. 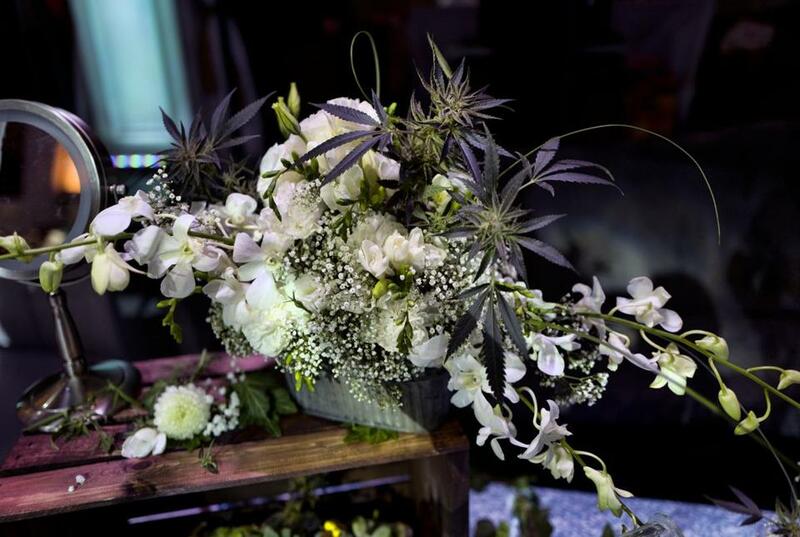 A bouquet handcrafted with fresh flowers, as well as fresh cannabis flowers, is displayed at the Bitchin' Bouquets booth. 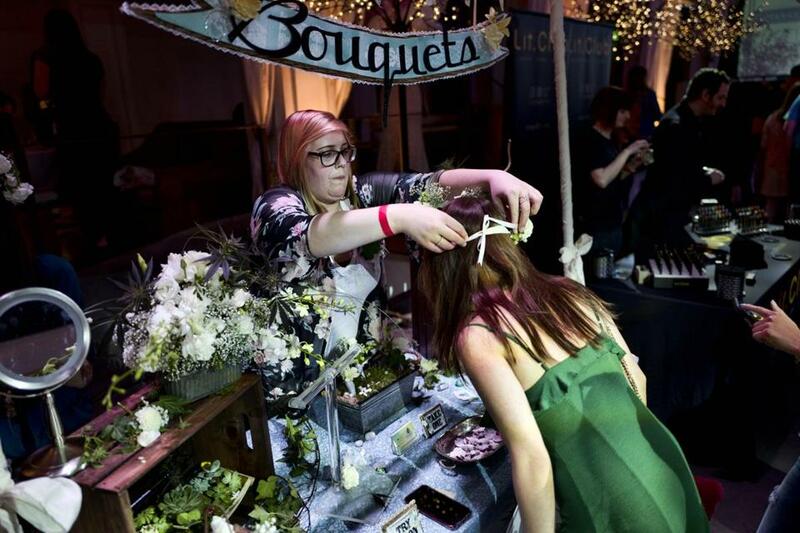 Jordyn Switzer with Bitchin' Bouquets, a floral service for all occasions, helps a visitor try on a floral headband using cannabis flowers. Violinist Crissy J plays on stage. 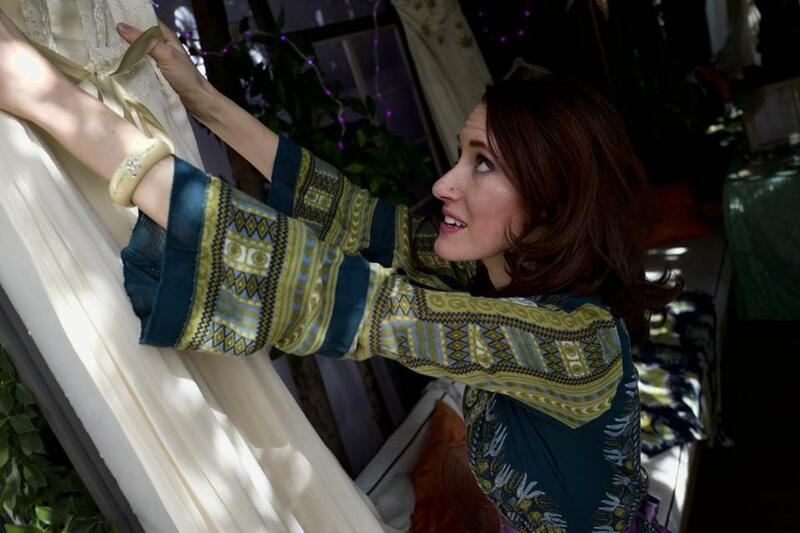 Janay A., owner and designer of High Vibe Bride from Kansas City, hangs one of her creations made from hemp silk at her display at the High Vibe Bride booth.